Brand new Voyag3r song Appearance Of The Mysterious Traveler, recorded exclusively for The Rise of the Synths companion album is being release on on May 1 via Lakeshore Records Bandcamp. Produced, engineered and mixed by Steve Greene at the Battle Chamber and mastered by Carl Saff. Lakeshore Records will release two official companion EPs for the upcoming documentary The Rise of The Synths this spring. 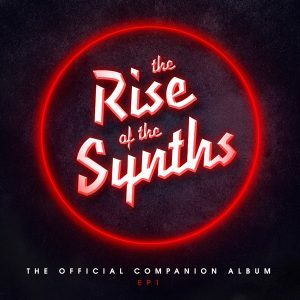 THE RISE OF THE SYNTHS EP 1 features tracks from Giorgio Moroder & Raney Shockne, Dance With The Dead, OGRE, Lazerhawk, Mega Drive, Voyag3r, and Carpenter Brut’s “Night Stalker”, which was released earlier this year. The EP will be released exclusively through Lakeshore Records’ Bandcamp on May 1 and through all digital providers on May 12. The Rise of The Synths is a documentary film project exploring the synthwave music scene. The filmmakers are interviewing both new artists and classic composers who helped to create the genre. The film is currently in production after a successful Indiegogo campaign. THE RISE OF THE SYNTHS EP 2 will be released in June. Stay tuned for more album details! See the EP 1 track list below. The film is a travel in time towards the roots of a worldwide grass-root music scene known as Synthwave, an irresistible blend of modern electronic composition with 80s pop culture’s nostalgia, that over the last two years has transformed from a whisper on selected internet hubs, to an ever-growing scene, expanding rapidly as we speak. Accounting millions of plays on social media, devoted fans are legion, but nobody in the mass media knows about them. Thousands of synthwave composers around the world are living out double-lives. Away from their normal everyday life they spend another half-life behind a faceless musical avatar, creating and uploading their own renditions of 80’s-styled film scores, sharing them with the world – surging the wave. They belong to an endless army of watchers for the master’s legacy: the sound that Edgar Froese, Paul Haslinger, Giorgio Moroder and John Carpenter created in the late 70s. A time travel into the universe of creating sounds. A love letter to human fascination and the collective memories of a universe that never existed.